Students at St. John Catholic School show off their toques to support Raising the Roof's Toque Tuesday campaign. Funds raised from the sale of the toques goes to help fight homelessness. Photo by Rushanthi Kesunathan. A local elementary school teacher is helping her students learn about empathy and compassion, calling it critical in today’s society as they participate in helping raise funds for Toronto’s homeless. “Happy Toque Tuesday! Today is a special Tuesday here at St. John’s because once again we help the homeless,” a St. John’s Catholic School student announced through the school’s PA system on the morning of Tuesday, Feb. 5. And it was a special day indeed for the student’s at St. John Catholic School on Kingston Road. 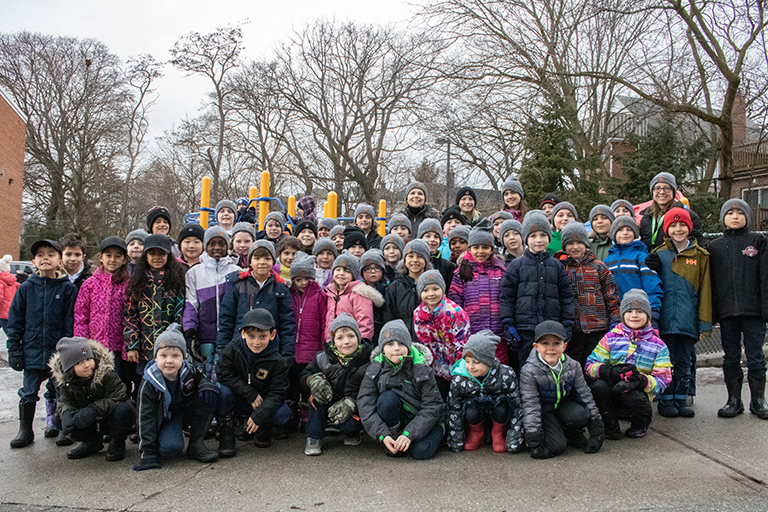 Tralee Reford’s Grade 1 students celebrated raising more than $1,000 through Raising the Roof’s Toque Campaign while sporting the toques they bought to create awareness towards homelessness. St. John is also the only school in the Toronto Catholic District School Board that formally participates in this annual fundraiser. With help from Reford, students helped promote the campaign and raise awareness about homelessness and the fundraiser through weekly announcements, selling toques during recess, and giving presentations to each classroom. They’ve been raising funds since January. “It’s important to help the homeless because they don’t have homes,” said Grade 1 student Tyrell Baker. Reford initiated the school’s involvement in the Raising the Roof campaign. She has also volunteered at Out of the Cold programs, often helping dish out hot meals and handing out food vouchers to the city’s vulnerable. “Helping Raising the Roof is the least that I can do as a person who is more fortunate and as a teacher, who has a responsibility to teach about this type of outreach and empathy,” Reford said. She does that at the school through reading and direct involvement in helping others. One of the stories she reads to her class is Ryan’s Well, which tells the story of a Grade 1 student from Ontario who raised money to build a well in Uganda and led to the creation of the Ryan’s Well Foundation. She said it is a story that still “wows” her. “I’ve learned over the years, that children have their own power and can do some very amazing things if they put their mind to it,” Reford said. The St. John’s community has been supporting the campaign since 2002, and have raised more than $32,000 in the last 17 years. In 2003, the school won the Gold Toque Award for top fundraiser for all elementary schools in Ontario. Now in its 22nd year, Raising the Roof’s annual Toque Campaign has supported nearly 200 community agencies across Canada. The campaign has raised more than $8 million in support of long-term solutions for homelessness. On Toque Tuesday, which is celebrated on the second Tuesday of February, volunteers and staff from Raising the Roof, sell toques and other merchandise at various GTA locations. The proceeds go towards helping the charity’s national homelessness prevention initiatives. The St. John’s school community will continue selling toques for the next two weeks.